Growing up as half-orphan with an Ufologist-Dad (Armin Sonntag) who's obsessed to prove to the whole world that alien exist, 12-year-old Luis hasn't had an easy and certainly not a normal life. As nobody believes Armin Sonntag, not even Luis, it's quite a big surprise when one day, three awkward little aliens (Mog, Nag and Wabo) crash-land right in front of Luis. Excited and without bias, Luis wants to show his Dad his discovery and finds out that his father would 'shockfrost' his new friends. Meanwhile the school principal suspects that Luis cannot be getting the attention and upbringing from his father that the boy needs and decides that Luis should be sent to a boarding school. 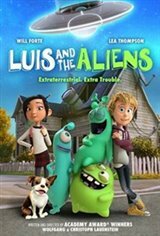 A wild adventure starts where Luis and his friends from outer space try to reach the huge mothership, to bring the aliens home.